It has been 236 days since Hurricane Matthew hit North Carolina, flooding the eastern part of the state. Almost eight months later, there are still residents living in hotels, children who have not returned to their home schools, and employees and business owners unable to get back to work. The storm caused $2.8 billion in damage and another $2 billion in lost economic and yet the state has only allocated $200.9 million in state funding for disaster relief assistance. 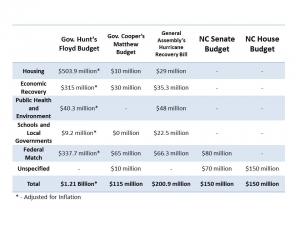 The House budget released this week fails to make the critical investments needed to help eastern North Carolina recover from the immediate damage and misses the opportunity to pursue rebuilding a more resilient region. By allocating only $150 million, the House budget, if passed as is, would bring the total state investment to just $350 million, which is woefully short of what is needed. In light of recent news that the federal government will give less than 1 percent of the $929.4 million dollars requested by Gov. Cooper and the NC Congressional Delegation, it is more important than ever that the General Assembly step up to the plate and lead the effort in rebuilding eastern NC. With $1.4 billion in the state’s Rainy Day Fund and an $800 million tax cut that will largely benefit wealthy residents and large corporations in the Senate budget, the question is not about the availability of resources. The question, instead, is where the values of lawmakers reflect the values of our state.